The most well-known church of Kefalonia island is that of Panagia Fidiotissa. Every year a phenomenon occurs in the small church in the vicinity of Markopoulos, on the south side of the island as from 6 to the 15th of August, the area is filled with small snakes, friendly to people, with a characteristic soft skin, and the shape of a cross adorning their backs. The snakes of the Virgin Mary are a unique event in the planet, and if you find yourself on the island in August, you should not miss it. If you can’t make it for this event, the miraculous Icon of the Panagia Fidiotissa is also there all year round and also famous for its miracles. The legend of the Virgin says it all began from a bush that was seen burning in Loggos. Approaching to extinguish the fire, they saw that only one tree was burnt and the icon of Virgin was in its roots. They brought it to the village church but the next day the icon was missing. They found it again in the same place and after this, it happened quite a few more times and so they realised that it was a divine sign to build the church of Virgin Lagouvarda. During the years a nunnery, dedicated to the Virgin Mary was created there. Again, according to legend, once upon a time pirates threatened the abbey. After the prayers of the monks, snakes encircled the monastery and repelled the threat. The miracle is repeated every year since then and this is how the appearance of snakes is explained by the tradition. It is also considered a bad sign if the snakes do not appear, which is highlighted by the devastating earthquakes in Kefalonia in 1940 and 1953. In August you can see the snakes making their way through the monastery and wandering among the faithful in the pews and shrines, the image of the Virgin Mary and the Gospel. 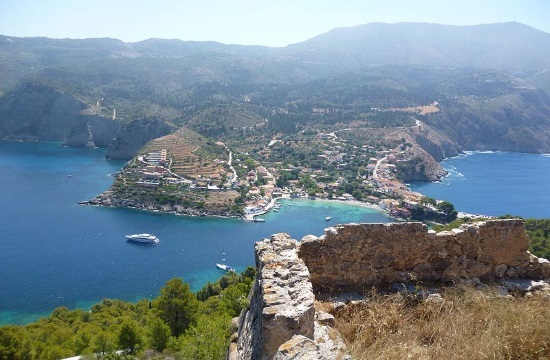 It is a remarkable fact that and a good reason to choose to spend the 15th of August on the island of Kefalonia.